Amy Feldman, Mock Zero, 2015, acrylic on canvas, 79 x 79". New York–based artist Amy Feldman’s exhibition “Mirror Cool” features four large paintings in two colors: cool gray pigment against stark white canvas. 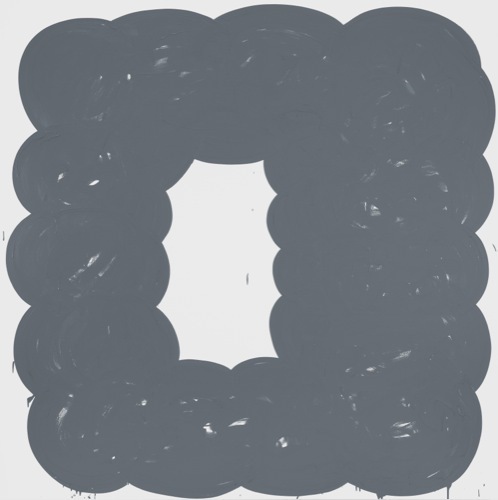 Each work is a 6.5-foot square canvas, but the painted images—bubbling rectangles in Mock Zero or cartoonish biomorphic shapes in I Is for Idiot, both 2015—emphasize verticality. Feldman, who works from preparatory sketches, quickly completes each painting in one sitting: the gestural brushstrokes, dripping paint, and swooping lines that compose the simple subjects underscore the sense of motion and speed. Although these are new works, Feldman has returned to previously used subject matter. For example, Former Future, 2015, a massive rectangle composed of large circles overlapping one another, is nearly identical to Holy Over, 2014, and very similar to O, 2014, and Owed, 2011 (the earlier works are not included here). With this repetition, Feldman seems less concerned with the image, resigned instead to highlight the act of painting itself. Indeed, these works are smart and intentionally elusive. Feldman claims influence from semiotics and wordplay, irony and stand-up comedy, and Robert Ryman’s monochrome. Really, these works rely on much more: the history of painting from Abstract Expressionism to Minimalism. If irony is at play, it at first seems disingenuously aligned with the exploitation of the viewer. On closer inspection, perhaps irony and repetition are tools for reconsidering the proliferation of images. But, then, to what end? While Feldman offers visually straightforward images, subversion and critique linger just beneath the surface.